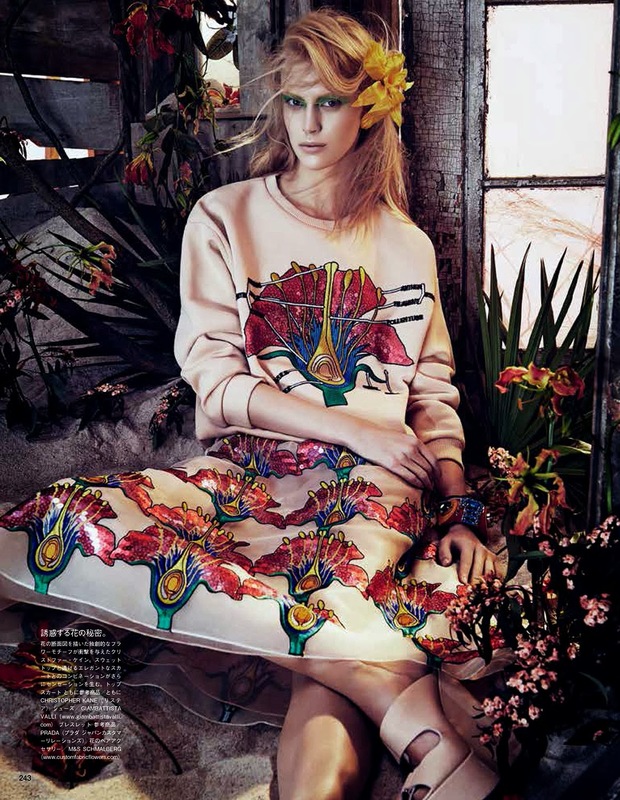 All-American beauty Juliana Schurig is in full bloom for Vogue Japan's March 2014 editorial featuring the Spring/Summer 2014 season's botanical-themed collections. Photographer Sharif Hamza captures the nineteen year old New Jersey native in colourful ensembles styled by Giovanni Battaglia from the Spring/Summer 2014 collections of Christopher Kane, Dolce & Gabbana, Fausto Puglisi, and Christian Dior. Schurig's delicate features, striking baby blues, and honey golden tresses are highlighted by iridescent eye shadow and fly-away hair courtesy of make-up and hair stylists Benjamin Puckey and James Rowe. In keeping with the "Tropical Heat" theme, Schurig's 178 cm lithe frame comes adorned with all manner of lush flora and fauna as she poses in a beachside cabin. All eyes will be firmly trained on Schurig heading into the Fall/Winter 2014 season, following a stellar Spring/Summer 2014 Couture show list which included turns on the runway at Elie Saab, Atelier Versace, Giambattista Valli, Armani Privé, and Chanel. Schurig's ubiquitous editorial presence in W Magazine, i-D, Interview, and the Australian and Chinese editions of Vogue, ensures the pristine beauty maximum blue chip appeal amongst casting directors, stylist, and designers in the month long Fashion Week frenzy ahead.